The ambiance, the neighborhood and the condominium lay out will make your townhome at Fairway Oaks feel like home and not like a hotel accommodations. 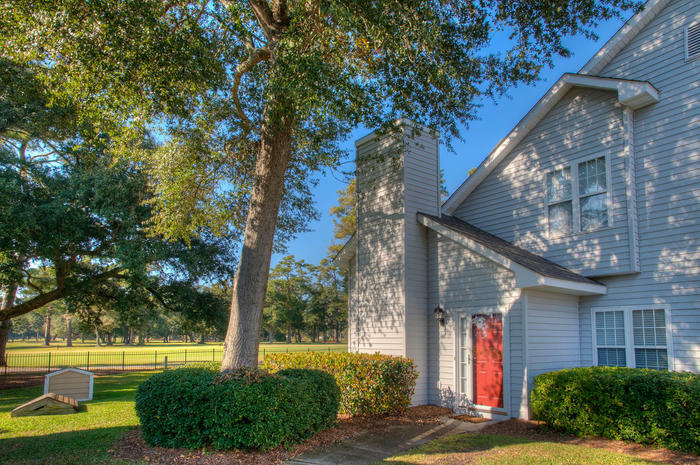 These beautiful North Myrtle Beach vacation rentals are perfect for families and attractive to golfers. Nestled beside a golf course, the manicured greens and fairways that are easily seen from Fairway Oaks add to the quiet atmosphere at this North Myrtle Beach resort. Fairway Oaks is a neighborhood in the Cherry Grove section of North Myrtle Beach, South Carolina. With two entrances from 20th Avenue North, this quiet townhome complex feels very residential, yet it is just five blocks from the hustle and bustle of the beachfront. The amenities at this North Myrtle Beach resort combine to give your family or your golf buddies a terrific North Myrtle Beach vacation. When you are guests at one of the North Myrtle Beach condominiums at Fairway Oaks you will have access to this North Myrtle Beach resort’s large swimming pool. Centrally located to all of these North Myrtle Beach rentals, the swimming pool is a gathering place where you can make new friends while enjoying the Myrtle Beach sunshine. Take it easy by the swimming pool and soak in the sun during your North Myrtle Beach vacation. The Fairway Oaks pool deck also features a hot tub that is an ideal way to unwind after a day on the nearby North Myrtle Beach golf courses. Loosen up in the hot water and let the bubbles and jets ease away your sore muscles. Taking it easy is what a North Myrtle Beach vacation at Fairway Oaks is all about. There is a private patio in each North Myrtle Beach condo rental at Fairway Oaks that offers a relaxing respite in the great outdoors. The white sandy beaches are right down the street and anytime of the day you can lose yourself in the sound of waves crashing ashore. The condominiums at this North Myrtle Beach resort are terrific. They are nicely decorated and very inviting. There are three private bedrooms in each of these townhomes. Your family can spread out among the bedrooms and everyone will get a good night’s sleep at Fairway Oaks. These townhomes are two-stories and offer plenty of space for larger families. Each North Myrtle Beach vacation rental at Fairway Oaks sleeps at least eight people, though some of these condos in North Myrtle Beach, SC can accommodate 10 or 12 folks. In addition to the three bedrooms at each Fairway Oaks North Myrtle Beach rental there are two full baths. The ground level of each North Myrtle Beach condominium has a kitchen, dining area and living room. The living rooms are tastefully decorated and feature comfortable furniture. Watch a movie on the DVD player provided for you or play a board game with the kids during your North Myrtle Beach vacation. Take advantage of the table and chairs in the dining area of each Fairway Oaks townhome. Write postcards to your friends back home. Eat breakfast and plan your North Myrtle Beach vacation day. The kitchen is fully furnished with dishes, utensils and cookware so you can make a meal in the comfort and privacy of your own condominium during your North Myrtle Beach vacation. Full-size appliances, a microwave, coffee maker and even a dishwasher are among the amenities you easily find in your Fairway Oaks kitchen. While the beach just a short walk away from your beautiful North Myrtle Beach condo, the pool is steps away from your front door at Fairway Oaks and the patio off the dining area is at your fingertips. Some of the patios have a grill on them so you may have a family barbecue during your North Myrtle Beach vacation. Furthermore, some of the North Myrtle Beach vacation rentals at Fairway Oaks have high-speed Internet access. The most obvious amenity at Fairway Oaks in North Myrtle Beach, SC is this North Myrtle Beach resort’s proximity to the Atlantic Ocean. Your family will be just a few short blocks away from the white sandy beaches and stunning oceanfront views. You can easily walk from your townhome at Fairway Oaks to the beach access down the street. Being this close to the beach means you can be on the oceanfront in time to catch an East Coast sunrise during your North Myrtle Beach vacation. The famous Cherry Grove Fishing Pier is nearby from which you can cast your line into the Atlantic or on which you can stroll and watch the other fishermen reel in their catch of the day. Fairway Oaks is near all the North Myrtle Beach amusements and attractions that help make the area so popular. There are numerous live entertainment theatres, including Carolina Opry, Alabama Theatre and Pirates Voyage. Shopping includes outlet malls, Barefoot Landing, Broadway at the Beach and the new Market Common. Ride the Myrtle Beach SkyWheel and walk down the new Myrtle Beach Boardwalk. Rent a Sea Doo, paddle a kayak, dine on oysters and run on the beach. Golf a championship golf course in North Myrtle Beach or hit the driving range during your vacation. It is all near Fairway Oaks! Make reservations today.